In many parts of the country, summer is synonymous with backyard barbecues, a practice that began in the 1950s as many Americans celebrated their newfound leisure time through casual outdoor dinners. After the frugality of wartime living, postwar home cooks invested in grills and other accessories for their suburban backyards. As many Americans enjoyed greater prosperity after World War II, meat took center stage on the plate. At the same time, men assumed a new role in many households: grill masters. While cuts of fresh beef were prized, many of the recipes we found in 1950s recipes from the Product Cookbooks Collection called for more affordable or convenient canned deli meats. Nanci, our brave team member who volunteered to make Barbecued Bologna, had a memorable experience asking for a three-pound loaf of unsliced bologna from her local grocery store. But once she had it in hand, she glazed it with a mixture of currant jelly and mustand, studded it with whole cloves, and grilled it over hot coals. While men socialized and tended to the grill, women still had domain over the indoors. In well-equipped, increasingly all-electric kitchens, they prepared salads and sides to accompany an outdoor meal. One cookbook we looked to for our 1950s potluck is titled Let's Get Acquainted with Your Hotpoint Electric Range. Not just a recipe book, it also serves as an instruction manual for the Hotpoint oven and stove. Furthermore, dishes are organized into entire menus for ease of cooking. The "budget oven meal" includes four dishes that all cook at the same temperature in the oven (including the Crown Roast of Wieners that we boldly taste-tested). The menu, which provides "dinner for eight," even gives instructions on how to situate the oven racks and where to place each dish. Swanson debuted frozen TV dinners during the 1950s, and the tagline "Just heat and serve!" became a hallmark of convenience. As more women worked outside the home—but were still assumed responsible for cooking—they turned to TV dinners that required little effort to prepare and serve. Of course, canned foods were the "original" convenience food and they continued to play a role in 1950s cooking. 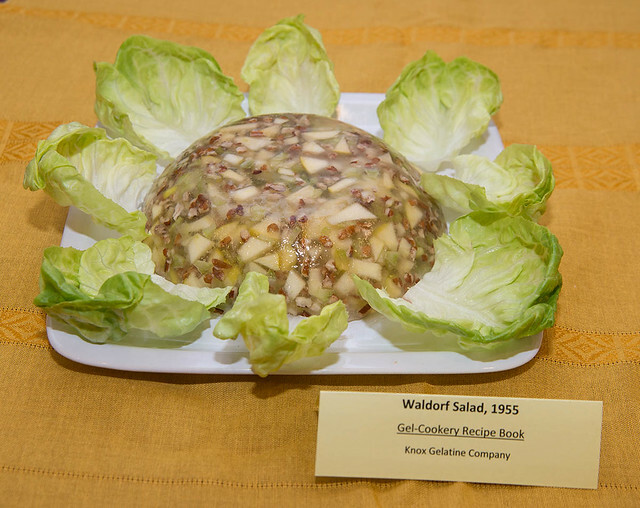 While selecting recipes for our 1950s potluck, we noticed that some of the dishes were made by simply combining two types of canned soup, or even a can of carrots with a can of pineapple. In recipes designed as much to sell canned soup as to result in tasty meals, canned tomato soup found its way into a cake, and condensed milk was used in a smoothie-like beverage called Carnation Fruit Flip. The Steak Stroganoff wouldn't have been complete without a can of condensed mushroom soup, and the base of a mock Hollandaise sauce was condensed cream of chicken soup. Some closing 1950s observations from the Taylor Foundation Object Project team? "The recipes are steadily getting better!" "Dessert is still the best." And, in stark contrast to the 1930s, "There’s nary a radish rose in sight." Caitlin Kearney is a new media assistant for the Taylor Foundation Object Project. Previously, she has blogged about mid-century cooking and Tupperware parties.